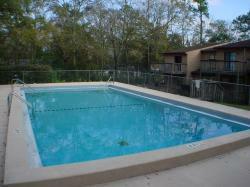 Tallahassee Florida Apartments for Rent! We have a 3 bedroom/2 bath townhome for rent at Indian Oaks West on Jackson Bluff Road with two decks overlooking the pool, security system, and full sized washer/dryer. 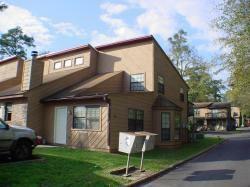 This is another great location within walking distance to the FSU stadium in Tallahassee. Enjoy the large vaulted ceiling in the tiled living area downstairs and full kitchen with refrigerator/freezer, range, and dishwasher. Included in the rent are monitoring and maintenance for the security system with Red Wire, basic cable/HBO with digital boxes, garbage, and yard maintenance. You will need utilities through City of Tallahassee and internet. Call for availability for Fall! We have a 2 bedroom, 1.5 bath townhome at Indian Oaks on Hayden Road with a washer/dryer as well as large and open living/dining/kitchen. The downstairs flooring is a modern painted concrete. You'll love the half bath and a small deck out the back door. Upstairs you'll find the two bedrooms and a bath with all wood floors. In addition to rent, you will pay for utilities, cable, and internet. Call for availability for Fall.